The morning comes with all its glory. 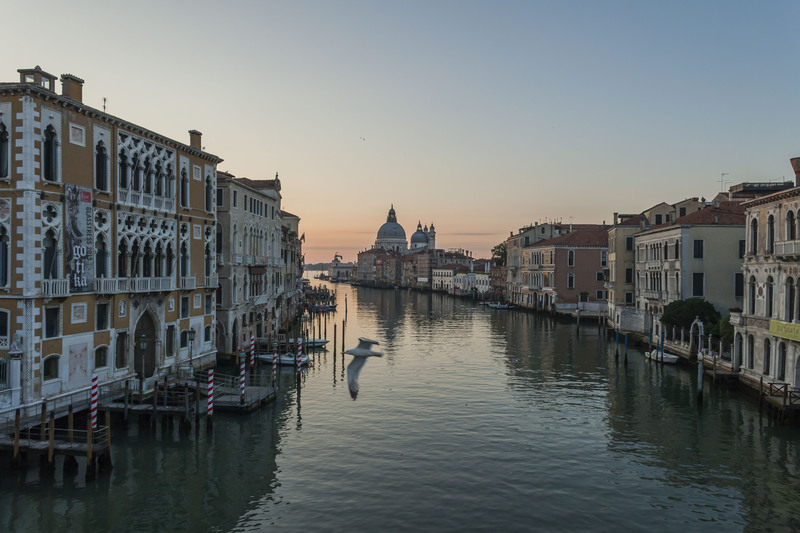 The waters of the Laguna are flat and calm, there is a slight breeze coming from the sea following the first rays of the sun that rises between the Doge Palace and the National Library towards the Piazza, swirl around and escape upwards. 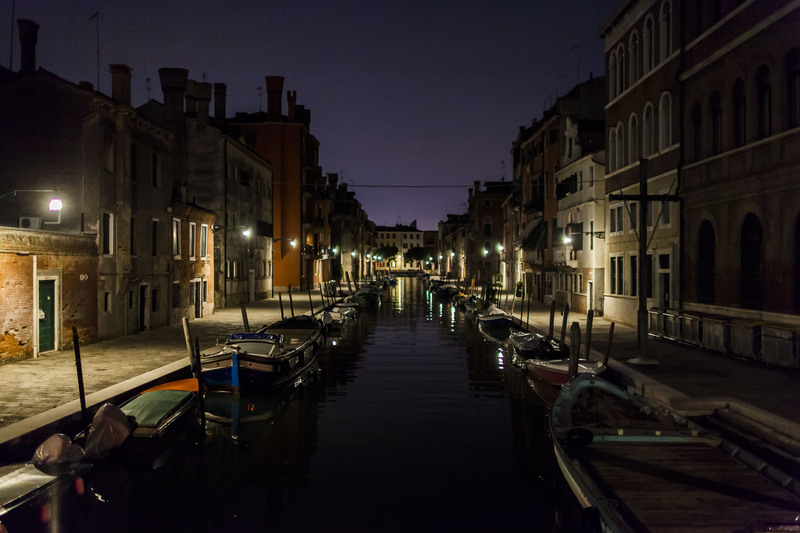 The Riva degli Schiavoni is immersed in reddish light, Canal Grande and Marcus Square are still in cool shadows. At the final table of Caffe Florian, towards Campanile, is sitting a group of Mexican tourists. They remain from the night before and are paying two musicians of the orchestra of the cafeteria since two hours for a private concert. On the table, there are bottles of red wine, coke, vodka and paper cups. The violin and clarinet player improvise „Contigo Aprendí“ by Mexican composer Armando Manzanero: „With you I learn to see the light at the other side of the moon”. In less than five hours, the world will sweat here and the masses will surge between Basilica and Procuratie. Will push and force itself through the narrow streets that were never meant for this. Passing Hermès and Bottega Veneta, Ermenegildo Zegna and Diesel. Leaving behind nameless shops which promise in their shopping windows „Tutto a 1 Euro. “ Chinese travel groups will stop in front of the displays of the discount shops and will meet their domestic export philosophy: Tutto made in China. 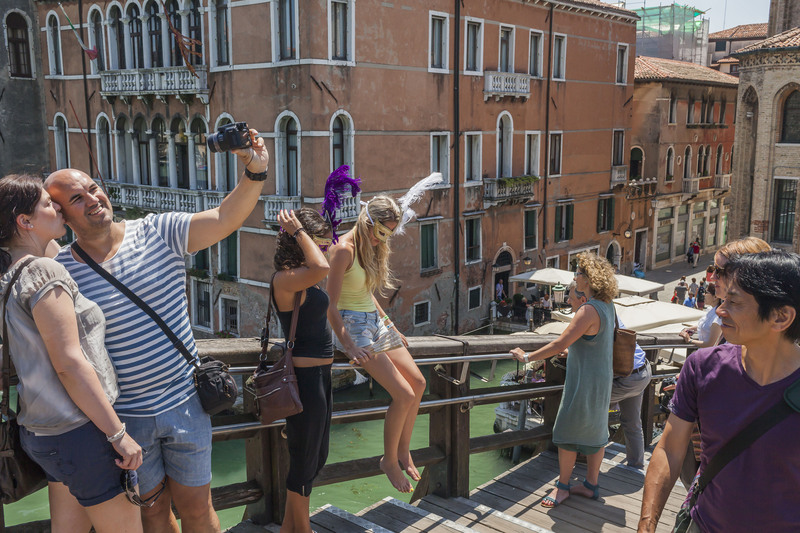 On the piazza, at the narrow passages and the stairs to the bridges towards Rialto, there will be street vendors that boldly urge tourists to buy selfie-sticks. So that the individual at least finds some distance to itself while taking pictures. 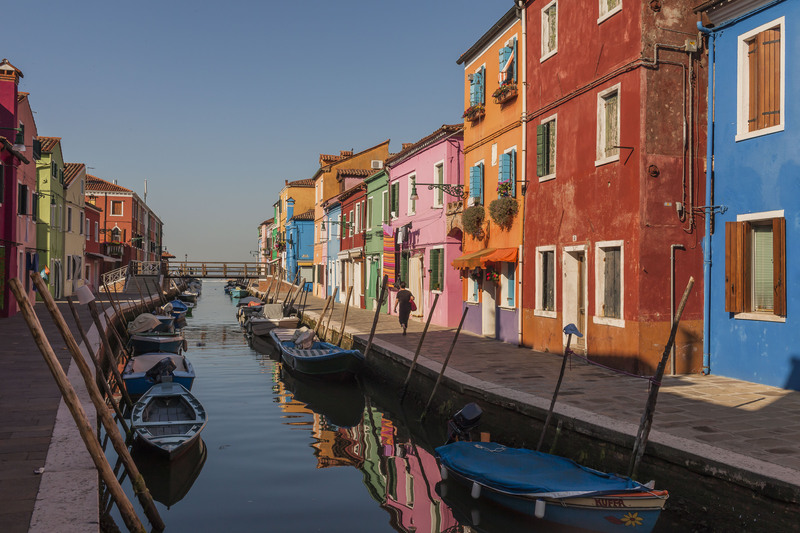 According to UNESCO, Venice is in clear and urgent need of a rich, diversified and sustainable cultural tourism policy and better tourism management that considers, first and foremost, the wellbeing of the local community. Every year, Venice is visited by approximately 26 million tourists, of whom just four million stay in Venice overnight, and only two million visit one or more cultural attractions, such as museums or art exhibitions. 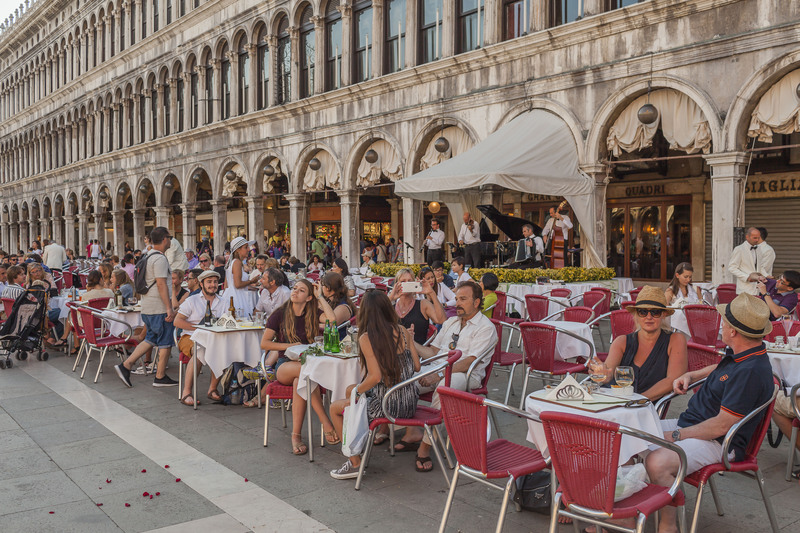 It was thus pointed out that tourism in Venice is not to be considered as ‘cultural’ at all; in fact, tourism in Venice could be better described as “free-riding on the city’s cultural beauty”. In all art cities, tourism is a key economic factor, but it needs to be dealt with wisely to avoid the devastating effects of mass tourism, which include, among others, pollution, congestion, gentrification and the crowding out of residents and non-touristic activities. 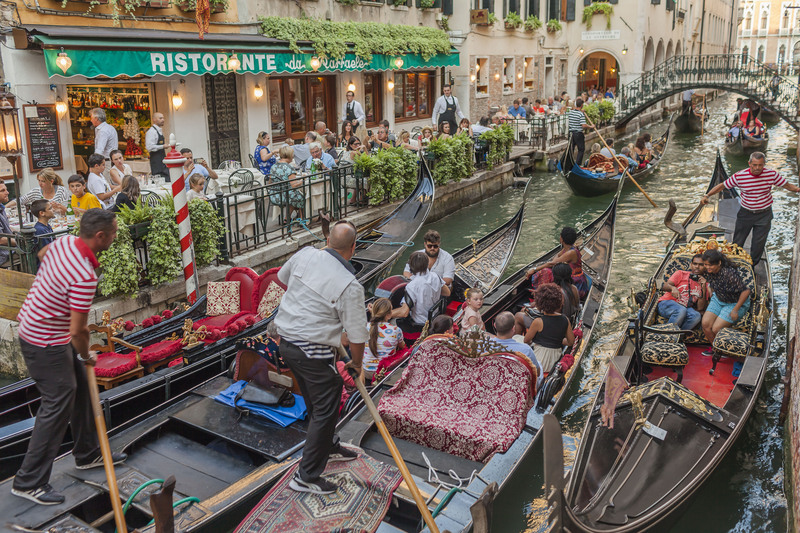 With the rise in ‘do-it-yourself’ tourism, facilitated by varied accommodation offers and low-cost flights, and coupled with the lack of proper planning and management of tourism flows, Venice is attracting an unsustainable quantity of visitors that harms the city’s wellbeing. During ten days of the year, total demand amounts to more than 100,000 visitors per day. Peaks of 200,000 visitors on special occasions are no exception in a city like Venice that has about 56,000 habitants. In fact, during two-thirds of the year the number of visitors easily surpasses the social-economic carrying capacity of the city. 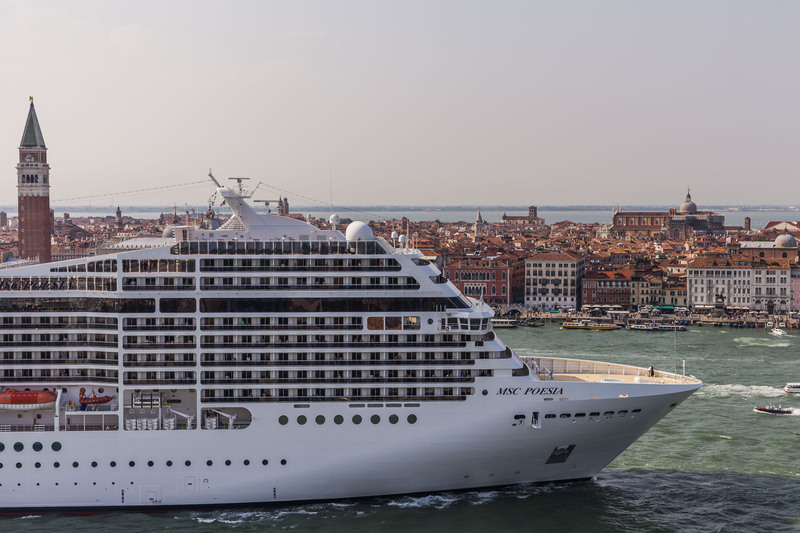 A ship cruise is passing by the San Marco Square and its bell tower in the Giudecca canal. Tourist navigating a canal on a gondola. 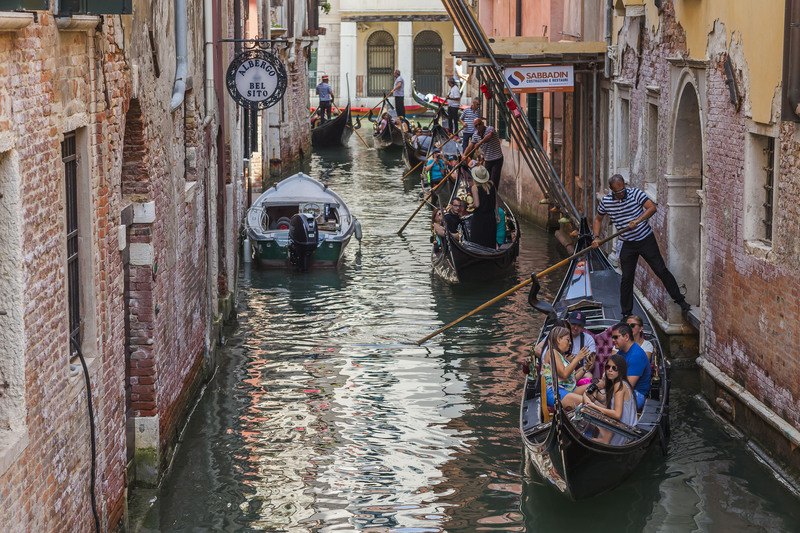 Gondoliers charge tourists, who want an experience on a typical Venetian boat, between 80,00 and 100,00 Euro for a 30 minutes ride. Tourists on the bridge of the Accademia across the Grand Canal. Tourist sitting at the famous Cafe Quadri in San Marco Square. A tourist feeding the pigeons in San Marco Square in front of the Basilica. 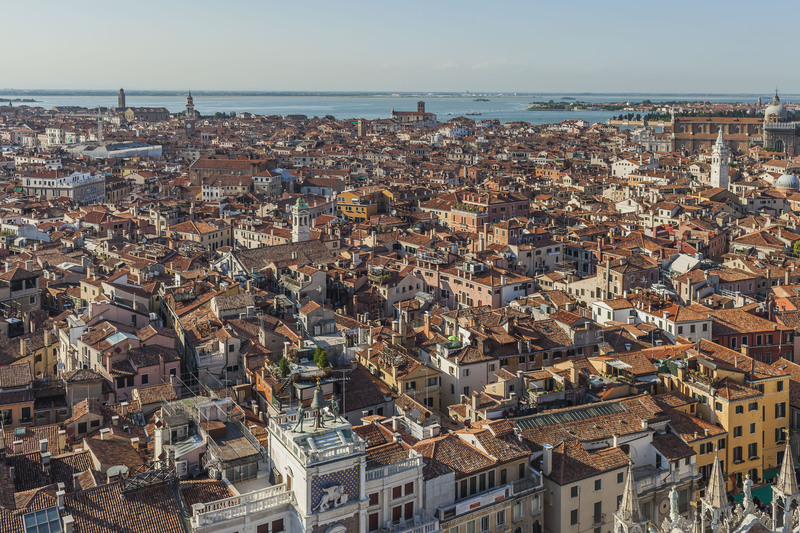 A general view of Venice and the famous Tower of the Clock building seen from the Bell Tower of the Basilica of San Marco. 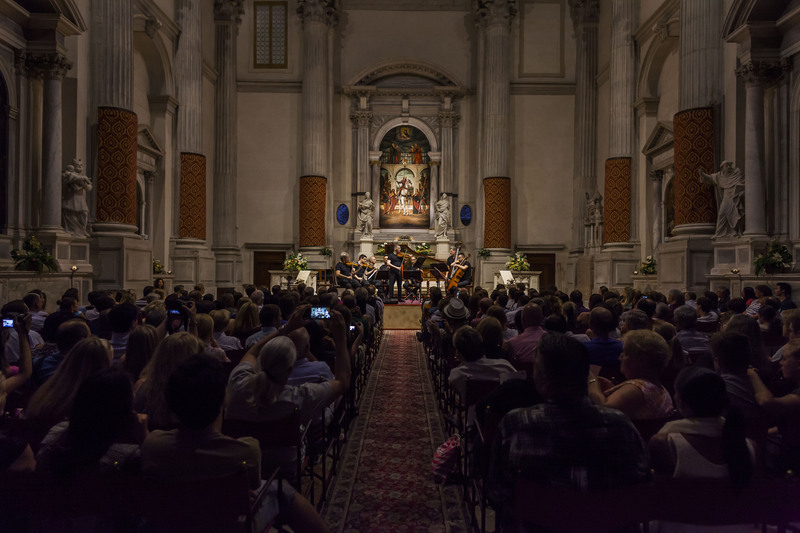 Tourist attend a classical music concert at the deconsecrated Church of San Vidal. 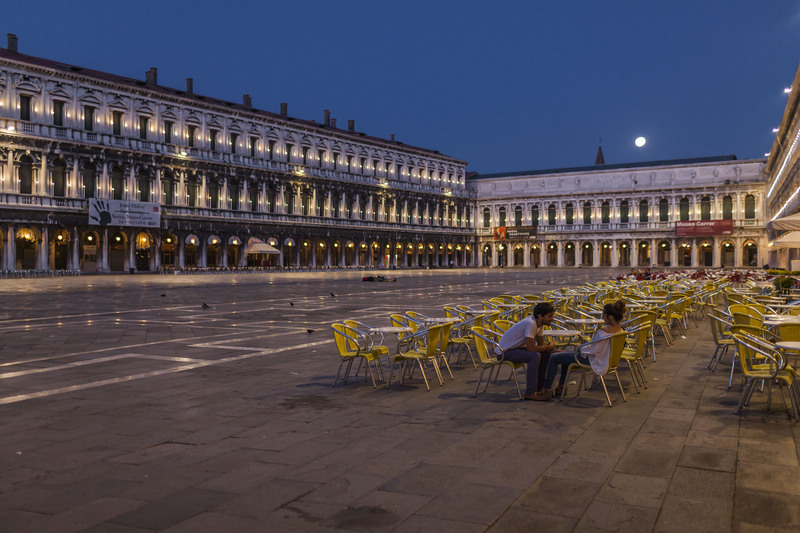 A couple of tourists sitting in San Marco Square in the middle of the night. 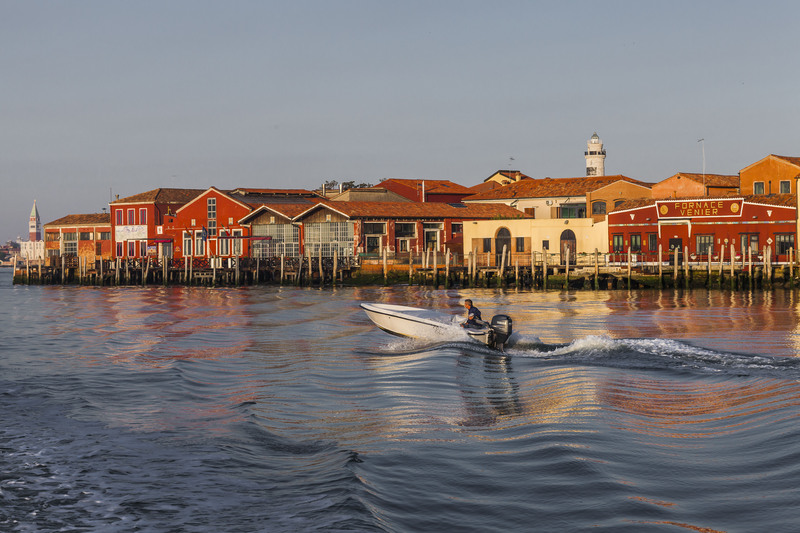 A general view of the Murano Island in the Venice Lagoon is seen from the ferry going to Burano Island. 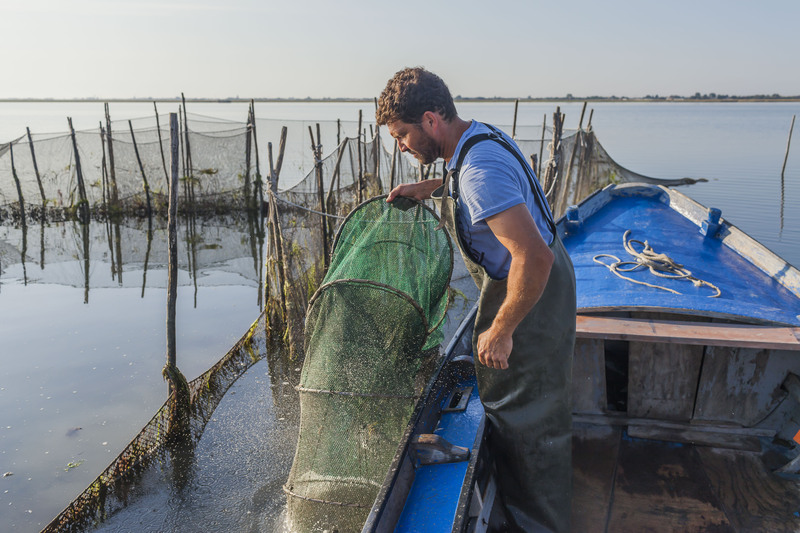 Venetian fisherman Domenico Rossi fishing on his boat in the Venice Lagoon near the Burano Island. 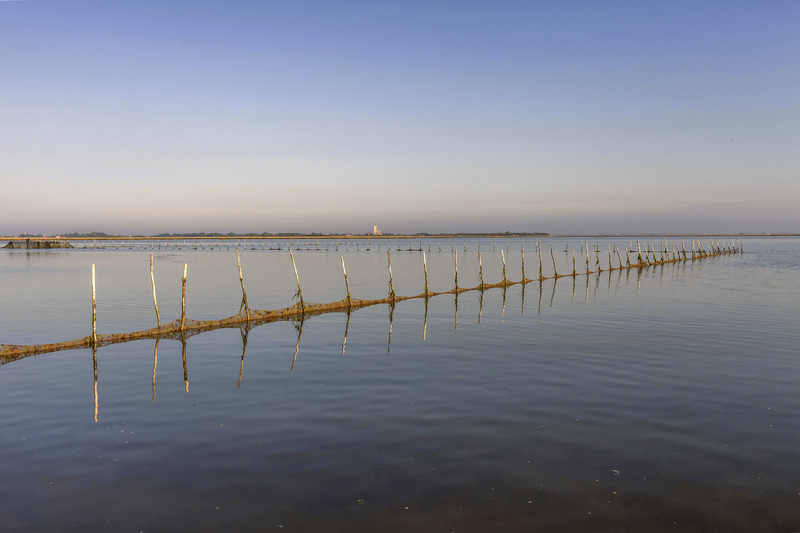 Venetian fishermen nets in the Venice Lagoon near the Burano Island. 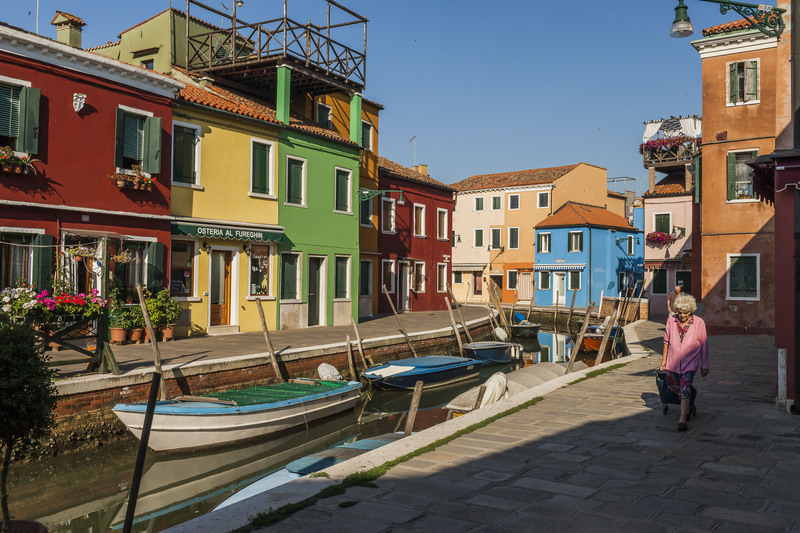 Typically colored houses of the Burano Island. 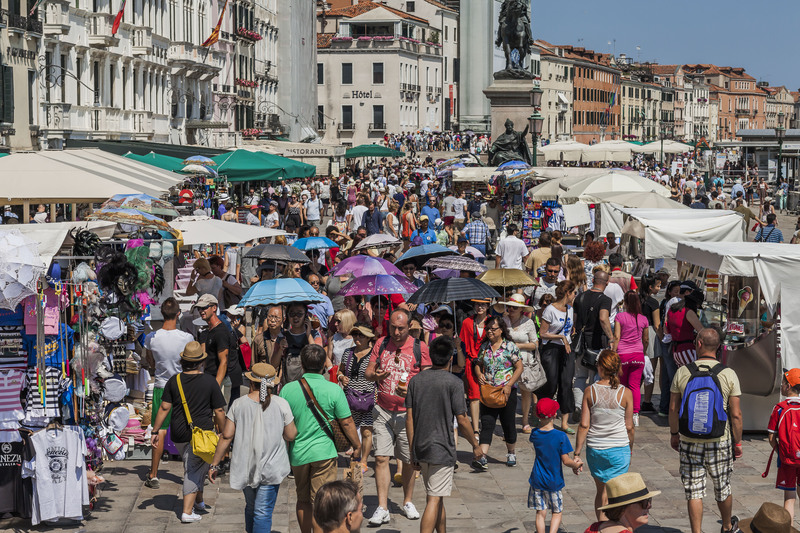 Thousands of tourists are gathering at the Riva degli Schiavoni next to San Marco Square. A Chinese tourist in her wedding dress in the city center. It is very common among Chinese tourists to come to Venice just to take a wedding picture portfolio with their wedding dresses and their photographer before going back to China to get married. A gondolier and tourists on a gondola in the Grand Canal in the foreground of the famous Rialto Bridge, currently under restoration. 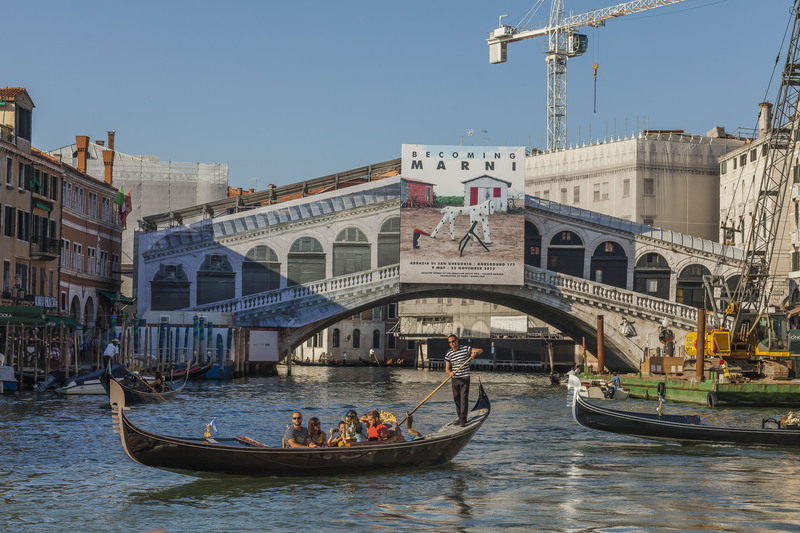 The Rialto Bridge is going through an 18-months restoration that begun in April 2015. The consolidation of the stone elements of the bridge that are likely to come off and the arrangement of the pavement with its waterproofing are the two biggest problems of the restoration of the Rialto Bridge, which has never undergone a radical intervention restoration for over four hundred years, since it was built. 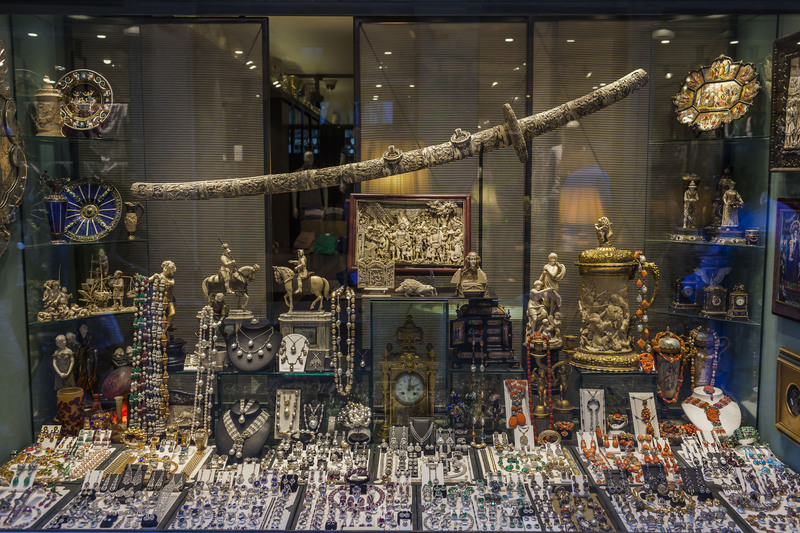 Tourist junk is seen on sale in a shop in the city center. Atelier Sogno Veneziano stylist, Giulia Russolo, working in her studio on a costume. 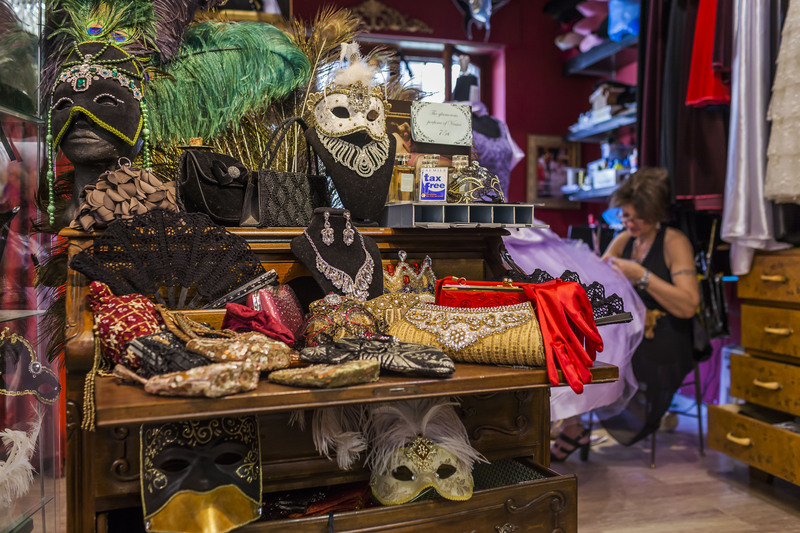 Giulia, owner of the business, rents typical Venetian costumes to tourists who want to have their picture taken. Priscilla Chane Fock, a 26-years-old tourist from Reunion Island is seen dressed in a Carnival costume. 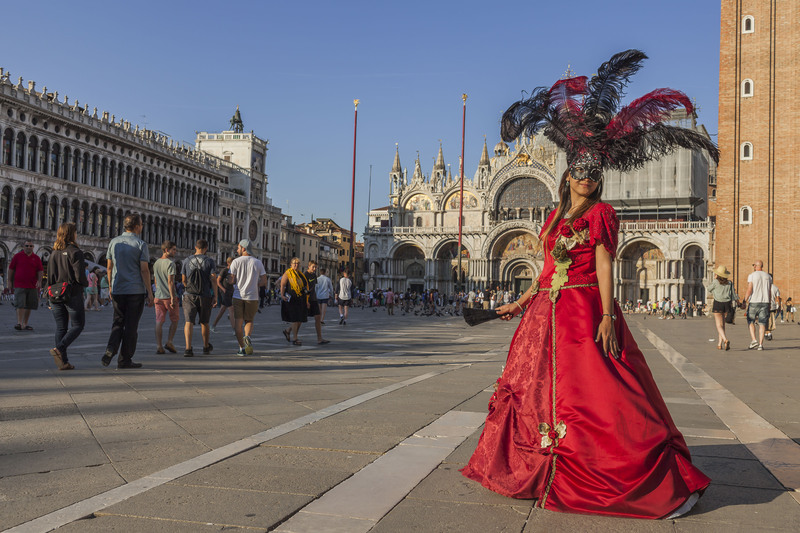 Priscilla decided to rent a typical Venetian Carnival costume on a hot summer day just to walk around Venice. Carnival is typically celebrated in February. 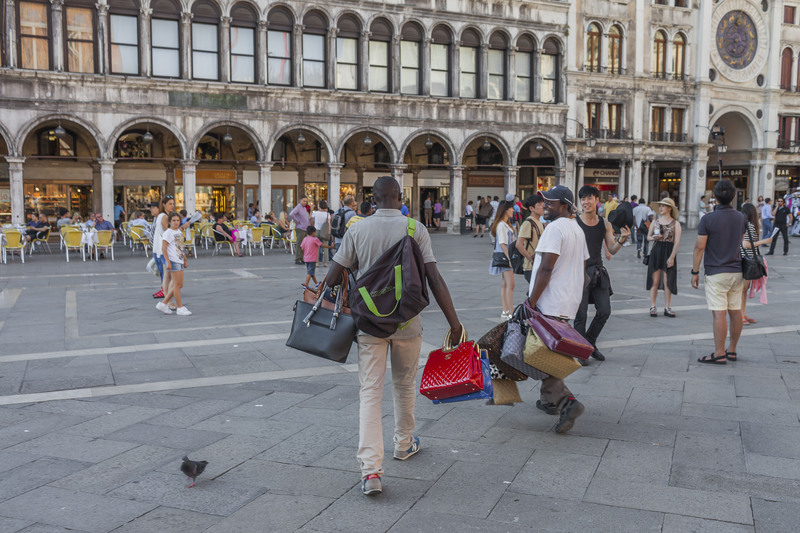 Immigrants selling fake luxury brands bags are seen running away as the Venice municipality police arrive to chase them away from the San Marco Square. 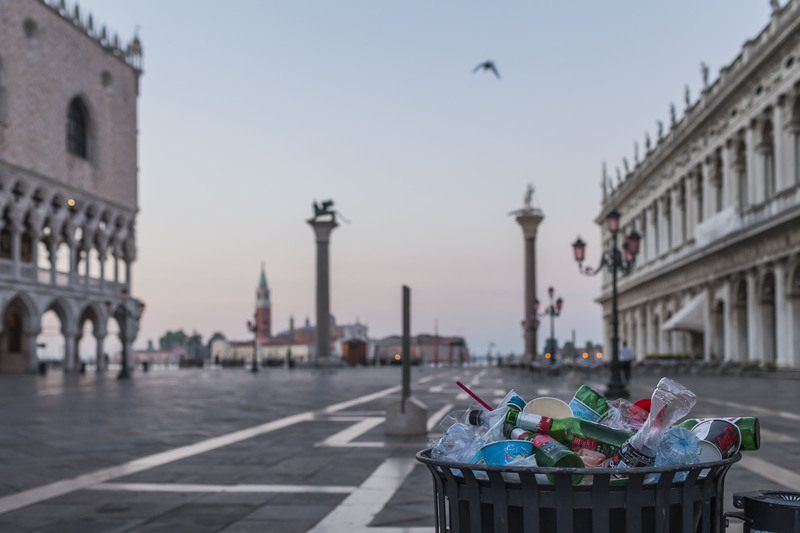 Trash left from the thousands of tourists who gather during the day in the San Marco Square in a garbage can in the early morning. Chinese tourist, Sherry Xie, 25-years-old is seen in her wedding dress during a photo shoot with her photographer in San Marco Square. 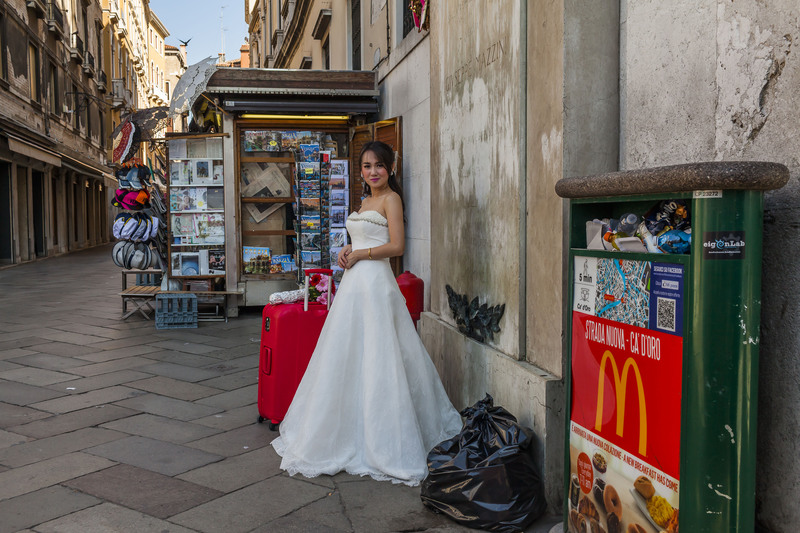 It is very common among Chinese tourists to come to Venice just to take a wedding picture portfolio with their wedding dresses and their photographer before going back to China to get married. A general view of the Grand Canal and the Basilica of Santa Maria della Salute from the bridge of the Accademia. 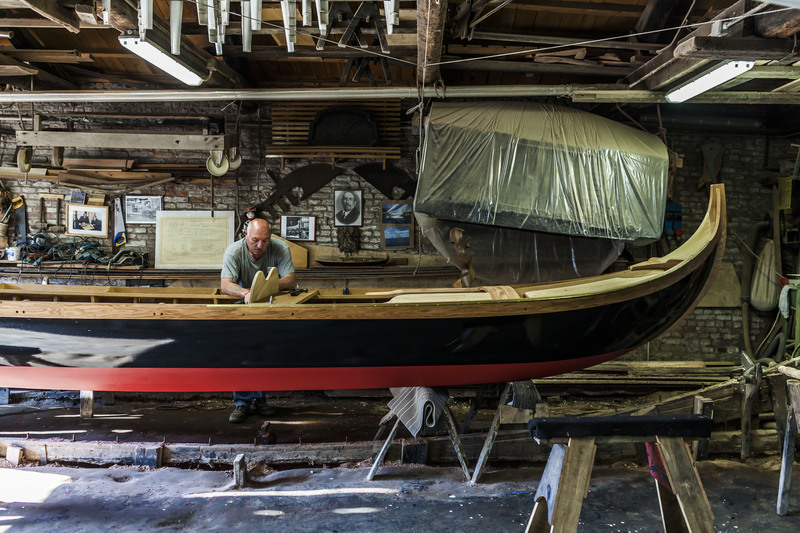 Venetian shipwright and gondola boat maker, Roberto Tramontin, working on a gondola in his dockyard. 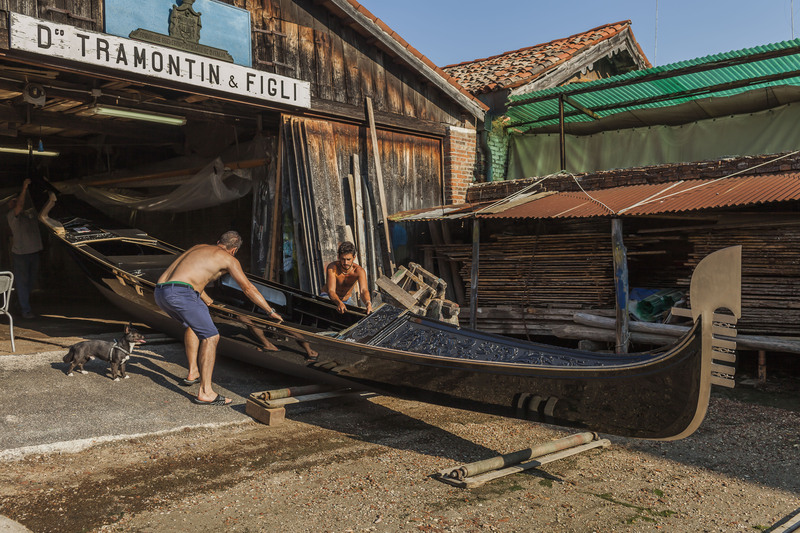 The apprentices of Venetian shipwright and gondola boat maker, Roberto Tramontin, working in his dockyard. 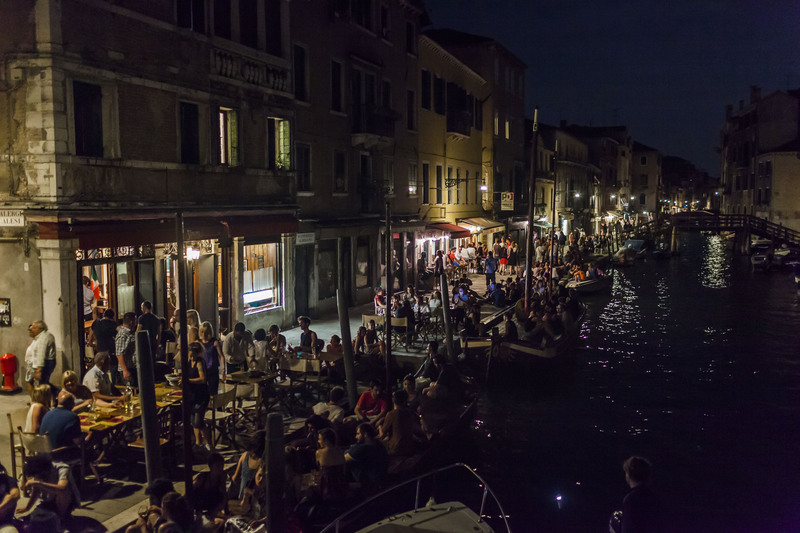 Tourists and Venetians are seen gathering for a drink or a meal at the Fondamenta della Misericordia on a canal in Cannaregio. The Fondamenta della Misericordia is one of the few locations in Venice, which is mainly frequented by Venetians. A general view of the Fondamenta della Misericordia in Cannaregio and the canal. The Fondamenta della Misericordia is one of the few locations in Venice, which is mainly frequented by Venetians. 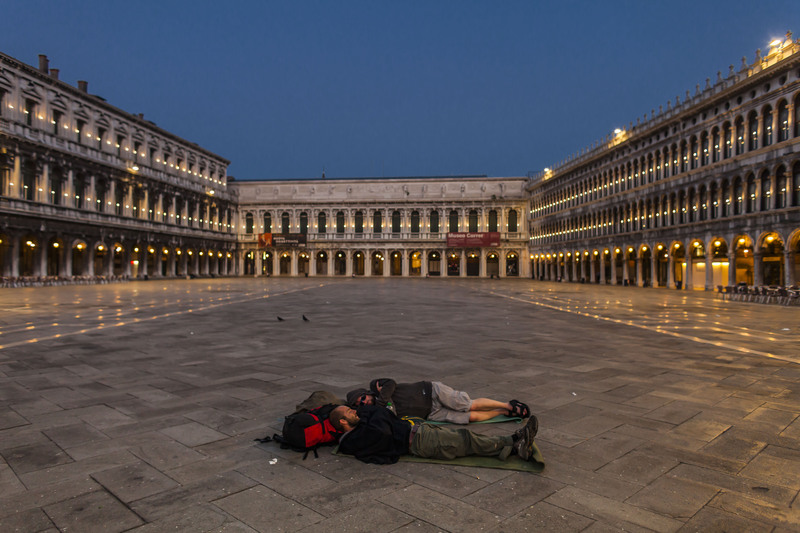 Two backpackers sleeping in the middle of the San Marco Square.